ABU DHABI, 7th November, 2018 (WAM) -- Under the patronage of His Highness Sheikh Mohamed bin Zayed Al Nahyan, Crown Prince of Abu Dhabi and Deputy Supreme Commander of the UAE Armed Forces, H.H. 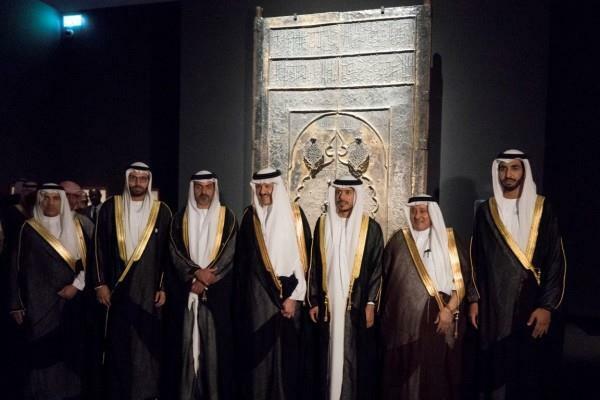 Sheikh Hamed bin Zayed Al Nahyan, Chief of the Abu Dhabi Crown Prince's Court, and His Royal Highness Prince Sultan bin Salman bin Abdul Aziz Al Saud, President of the Saudi Commission for Tourism and National Heritage (SCTH), today opened "Roads of Arabia: Archaeological Treasures of Saudi Arabia", the second international exhibition of the museum's cultural season. Attending the event were H.H. Sheikh Abdullah bin Zayed Al Nahyan, Minister of Foreign Affairs and International Cooperation; H.H. Sheikh Diab bin Mohamed bin Zayed Al Nahyan, Chairman of Abu Dhabi Department of Transport; Sheikh Sultan bin Tahnoon Al Nahyan, Member of the Executive Council; Sheikh Shakhbout bin Nahyan Al Nahyan, UAE Ambassador to Saudi Arabia; Sheikh Zayed bin Sultan bin Khalifa Al Nahyan; and Noura bint Mohammed Al Kaabi, Minister of Culture and Knowledge Development, along with a number of dignitaries and senior officials. Sheikh Hamed hailed the organisation in the UAE of the event which narrates the historical and human civilisation of the Kingdom of Saudi Arabia and the Arabian Peninsula in its entirety. "Hosting the event in the UAE goes in line with the strong fraternal bonds and historical commonalities between the two countries," Sheikh Hamed said. Sheikh Hamed noted that the exhibition represents an important opportunity to learn about the civilisation of Saudi Arabia and the Arabian Peninsula and its rich cultural heritage and historical and humanitarian elements throughout the ages. "The exhibition enriches the cultural and intellectual landscape in Abu Dhabi and boosts the UAE's leading position on the world scene." H.H. Sheikh Hamed commended the role of the Custodian of the Two Holy Mosques King Salman bin Abdulaziz Al Saud of Saudi Arabia and the importance he is attaching to the historical and cultural heritage of the Kingdom as well as his keenness to maintaining channels of fruitful communications between various cultures. "Roads of Arabia: Archaeological Treasures of Saudi Arabia" explores five chapters in the history of the Arabian Peninsula, spanning early prehistoric settlements; maritime exploration; caravan trading routes that linked the region with Asia, Mesopotamia and the Mediterranean; routes of holy pilgrimage emerging in the 7th century CE; and the social and economic developments between the 14th and 16th centuries that set the stage for the modern day region. Fourteen acclaimed editions of the show have toured throughout Europe, the USA and Asia, before now coming back to the region at Louvre Abu Dhabi, where it is enriched by selected pieces from the UAE. The exhibition was conceived through cooperation between SCTH and the Musée du Louvre in Paris, where it was first presented in 2010. It is one of the most renowned Saudi exhibitions internationally, introducing Arabia's cultural and historical heritage to over five million visitors worldwide. On this occasion, His Royal Highness Prince Sultan bin Salman bin Abdul Aziz Al Saud, President of the Saudi Commission for Tourism and National Heritage, expressed his happiness at visiting the UAE during the Year of Zayed, saying the showcase contributes to achieving the ambitions of the UAE Founder and other leaders of the region for ensuring integration among the Arabian Peninsula's peoples. "The organisation of Roads of Arabia: Archaeological Treasures of Saudi Arabia exhibition in Louvre Abu Dhabi, within its tour to the most popular museums worldwide, takes place at an important stage in the history of the Kingdom of Saudi Arabia, led by the Custodian of the Two Holy Mosques, King Salman bin Abdulaziz. The Exhibition is held in line with the approach adopted by the Kingdom, which is based on giving due attention to history and heritage within the archaeological sector that was established more than 50 years ago, as well as on the concern for human communication among peoples and building bridges across cultures". He praised the significant efforts made by the UAE in preserving and investing its cultural heritage, being "a key tributary of the country's history and economy." Mohamed Khalifa Al Mubarak, Chairman of the Department of Culture and Tourism Abu Dhabi, said, "Roads of Arabia: Archaeological Treasures of Saudi Arabia forms the centerpiece of our latest cultural season at Louvre Abu Dhabi. The exhibition embodies a significant friendship and convergence between the United Arab Emirates, Saudi Arabia and France. With the museum located at one of Abu Dhabi's gateways to the Arabian Peninsula, I can't think of a more appropriate exhibition to present on the occasion of this institution's first anniversary." Manuel Rabaté, Director of Louvre Abu Dhabi, said: "Over the past year, Louvre Abu Dhabi has been telling the world's universal story through its international exhibitions and innovative programming. Louvre Abu Dhabi's ambition is to celebrate cross-cultural connections and highlight bridges between civilisations. We launch the exhibition's programme in our anniversary week with On the Roads of Arabia, a world first showcasing more than 80 talented musicians and their respective cultures from across the ancient trade routes of Arabia." Dr. Souraya Noujaim, Scientific, Curatorial and Collection Management Director at Louvre Abu Dhabi and Co-Curator of the Exhibition, added: "Louvre Abu Dhabi's international exhibitions are always an extension of the artworks and stories we present in our permanent galleries. As part of our season, Worlds of Exchanges, our latest exhibition Roads of Arabia: Archaeological Treasures of Saudi Arabia tells the story of this region and offers a closer look at its interconnected history and heritage, across roads weaved throughout the peninsula. Noemi Dauce, Chief Curator for Archaeology at Louvre Abu Dhabi and Co-Curator of the Exhibition, commented ‘Roads of Arabia: Archaeological Treasures of Saudi Arabia' has been critically acclaimed worldwide, starting with the Musee du Louvre in Paris in 2010. Louvre Abu Dhabi is delighted to present an updated edition which will include rare Emirati artefacts, which have been uncovered by numerous archaeological excavation projects in the UAE, as well as objects loaned by some of our French partners, including Musée du Louvre, the BNF and Musée des Arts Décoratifs." H.H. Sheikh Hamed, H.H. Sheikh Abdullah, H.H. Sheikh Diab, Prince Sultan and other attending sheikhs and dignitaries made a tour of the exhibition which showcased important archaeological pieces from the United Arab Emirates, including a pearl found in Umm Al Qaiwain dating from 5500-5300 BCE (loaned by Umm Al Qaiwain Museum); a stone decorated with a wild camel from the late 3rd millennium BCE (loaned by Al Ain Museum), as well as objects from Julfar (loaned by the National Museum of Ras Al Khaimah). As part of the programme, Emirati artist Hind Mezaina has curated a series of film screenings, taking place each Saturday from 5 - 26 January, featuring documentaries and films relating to the Arabian world, past and present.